Magnoplasm paste is an effective initial treatment for those suffering from boils, carbuncles and whitlows. 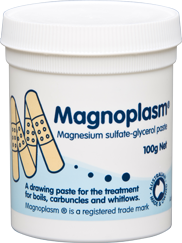 Containing glycerol and magnesium sulphate, Magnoplasm Paste draws water out of the inflamed area and assists the healing process. Spread paste (about 5mm thick) on the inflamed ares and cover with a non-adhesive dressing. Change the dressing after 12-24 hours and repeat if necessary. 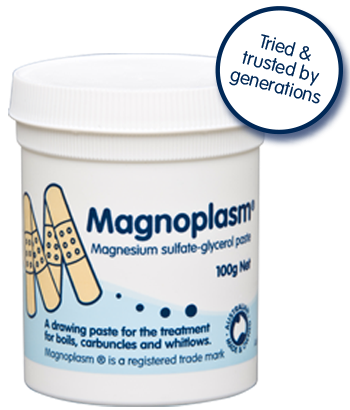 Magnoplasm Paste can be applied cold, straight from the jar or warmed to aid spreading. If necessary to warm the product, first warm a glass jar/cup, then add the required amount of Magnoplasm directly into the container. The warmth of the container should help soften the Magnoplasm and make it easier to apply. Alternatively, warm gently in your hand or immerse the jar in warm water making sure the water level is a little below the cap (to prevent water entering the jar). Do not use a microwave to heat Magnoplasm as products tend to deteriorate at higher temperatures and scalding can occur. Available in a convenient take-anywhere pack. 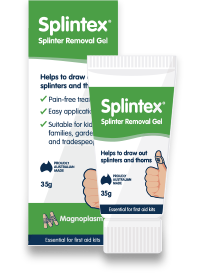 Forget the needles, tweezers and old-fashioned splinter remedies - Magnoplasm Splintex Gel makes the job easy and pain-free. It’s especially useful for those hard to reach areas like under the nails and in hands and feet. Splintex helps draw out splinters, thorns and ooze using the process of osmosis (drawing moisture to the skin). Spread paste (about 5mm thick) on the affected ares and cover with a non-adhesive dressing. Change the dressing after 12-24 hours and repeat if necessary. 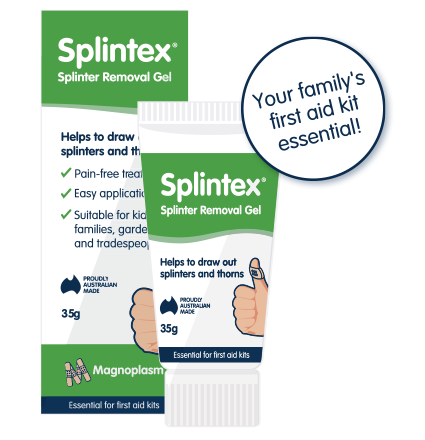 Magnoplasm Paste and Magnoplasm Splintex Gel are proudly Australian made and owned. Available at leading pharmacies across Australia. We're here to tell you more. Contact us on 1300 081 849 (Austalia only) or fill in the form below. 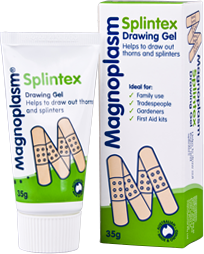 Magnoplasm and Splintex are a registered trade marks of Mayne Pharma International Pty Ltd. Prolonged use may damage surrounding skin. Always read the label. Use only as directed. If symptoms persist see your healthcare professional.